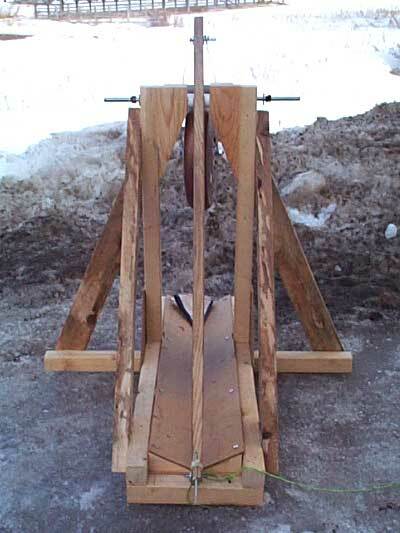 To be involved in the Trebuchet contest bring a 2 1/2-foot scale Trebuchet. Materials of your own choice. Wood, metal, licorice sticks, extra points for chicken bones! Ammunition will be provided. I emailed the autocrat, Lady Janet Kempe, for more details and limitations. All I was told was that it had to be able to fit inside a 2.5 foot cube, the event was to be indoors at a community hall with high ceilings, and the projectile was to remain a secret until the event. She did tell me that the projectile was approximately 2 x 2.5 x 2.5", and the mass was about 40 grams. At one point I asked her if they were going to be eggs (given the "Fowl" theme), and she replied "No, I don't want to have to clean it up". the primary goal was distance. My other size limitation was that it must fit (with beam and CW removed) in the back of a Ford Taurus station wagon, with a rear hatch clearance of 66 cm (26"). It was a long drive. It looks a bit lop-sided because the front end (towards the left) has no angle supports. 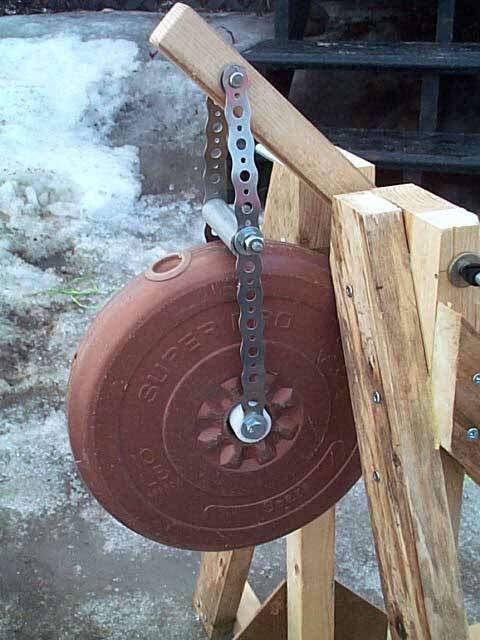 The counterweight is a 4.5 kg (10 pound) barbell weight that I got at a Salvation Army thrift shop. The beam was an old hockey stick, 2 for a dollar at a yard sale. I found some short pine 2x2s (actually 35x35 mm) in my car trunk - leftovers from the construction of Hotspur. The pouch was borrowed from the trebuchet Hotspur. I found the twine for the sling in the Save-Easy (grocery store) parking lot. It was fluorescent green so it caught my eye. 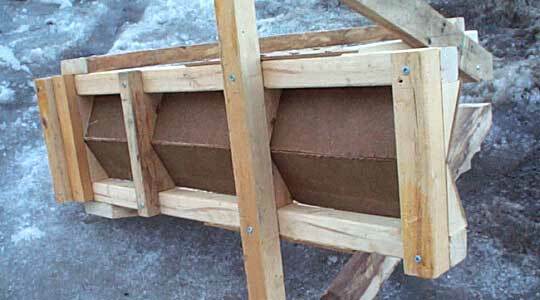 The trough and A-frame gussets were cut from a piece of thin MDF that was part of an Ikea bunk bed. Most of the frame was cut from decking boards bought at a salvaged building materials yard ("Happy Harry's", Sackville, NB"), $1.00 per 8' board. Some of it looked a bit moldy, but that was just on the surface. I already had the half bottle of glue, but I had to buy the wood screws, eyescrews, clevis pin, and keyrings. The axle had originally been used on Hotspur, but had been swapped for a thicker rod. Ground to top of axle post: 60 cm (23 5/8"
Counterweight hanger length: 22.8 cm (9") - chosen for maximum length such that the bottom of the counterweight did not hit the trough on follow-through or at rest. The above view shows how I glued short axle support braces onto the inner sides of the vertical axle posts. The outrigger angle braces also extend beyond the posts and were glued and screwed to the posts and short axle support pieces. The third crossbar from the right was cut from a solid board, but the other three trough supports were triangular pieces glued on. I ran a bead of glue on the V pieces before screwing the MDF down. Both rings are the split keyring type. 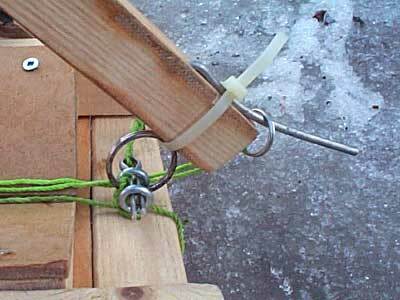 The larger ring has the captive end of the sling tied to it and serves as part of the trigger system. The pin rests in a shallow groove to keep it aligned, and there's a 1/2" deep hole drilled where the pin disappears into the arm. I filed some grooves in the corners of the arm where the nylon ty-rap goes, to keep it from slipping off the end and to reduce the sharpness of the bend. The ty-rap is the type with a little release tab so it can be removed and re-used. The dark roughness along the top of the beam is fibreglass that didn't get sanded off. The hanger strap is 24 gauge 3/4" steel strapping, found in the plumbing section of most hardware stores. You get 10' for a couple of bucks, so it's one of my favourite materials for counterweight hangers. It bends easily and has all these holes pre-punched. The label indicates a maximum load rating of 130 pounds, but it also says "maximum load shown is 1/3 of breaking load for single straps". I think I'm safe. It also comes in 20 gauge steel, with a rating of 210 pounds. The white plastic (high-density polyethylene) bushing just serves to fill the space between the bolt and the inside of the weight's hole, to keep it from wobbling. If the weight was all-metal, it would also act as a low-frction bearing. The CW hanger axle is a pin with factory-made holes ("clevis pin"), and it's secured with a hairpin type clip. The short length of grey plastic pipe is a spreader to keep the hanger straps from rubbing on the CW. The CW appears to touch the outrigger angle braces in this photo, but it doesn't. View from the front end, in uncocked position. This also show the length of the sling. Once I got there, I realised that I had been hosed. I had the only trebuchet. Two of the others were "spoonapults*" powered by bungee cords, one was a torsion-powered spoonapult, and the fourth was a proper torsion-powered onager* with a sling, the smallest engine there. One or two of the spoonapults were, I'm sure, in violation of the maximum size regulation. But, being the sportsman that I am, I didn't raise a fuss. All in good fun. 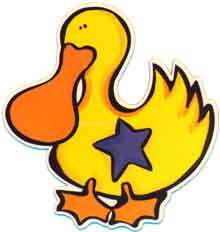 The projectiles were handed out, two per engine -- little yellow rubber ducks. We set up at one end of the hall and took turns firing at the far end. His Excellency Baron Seumas Camshronach an Lochabair sat (somewhat foolishly, we believed) off to one side at the far end. Most of us surreptitiously nudged our engines a bit to the left, I noticed. I started off with a sling length of 75 cm (aprox 29 1/2"), slightly longer than the throwing arm length, and a release pin angle of about 35 degrees. It fell shorter and released at a higher angle than I expected, so I bent the pin a bit more. Even so, I was beat out by the onager, which hit the far wall. Later, however, one of the gentles with the persona and garb of a Fool (sorry, the name escapes me) volunteered to be a target in the middle of the room. I managed to hit him twice in three attempts, while none of the others struck him more than once. Therefore, I was awarded the prize for accuracy - two fabulous and large fridge magnets. 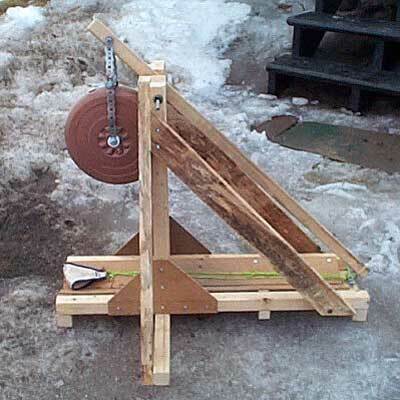 Later on, we took them (the siege engines) out in the parking lot. The smallish (2 feet long?) onager still beat everybody else for distance, but all noted that my engine was the quietest one. Even though it looks thin, the arm is rather heavy. 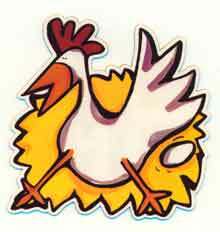 I might make a new one out of a pine 1x2", tapered to 1x1" at the pin end. My best distance (with the ducks) was something on the order of 10-15 meters. It occurs to me, however, that a hockey stick handle might make a good arm for a small onager*. More counterweight than ten pounds. The only reason I ddn't throw on 45 pounds was because I knew the payload was going to be very light, and it was to be fired indoors. A mythical siege engine found only in movies and on TV. They are characterised by a spoon or spatula-shaped projectile cradle on the end of a beam, whether gravity or torsion powered. Kevin Costner and Morgan Freeman rode on one in Robin Hood: Prince of Thieves. Wile E. Coyote had some issues with a spoonapult manufactured by Acme. 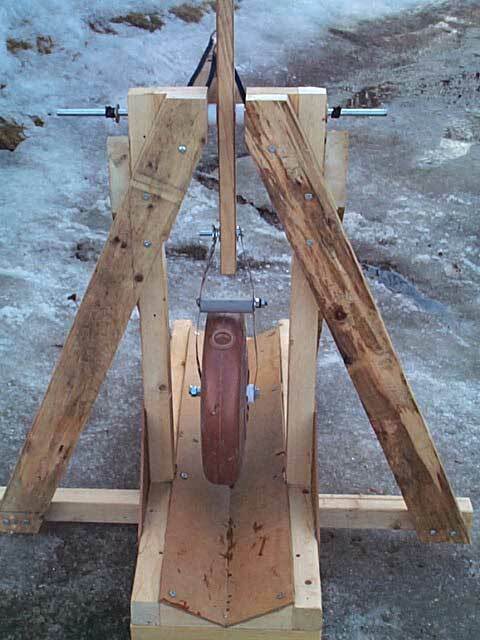 Real siege engines (except for ballistae) had slings and pouches. 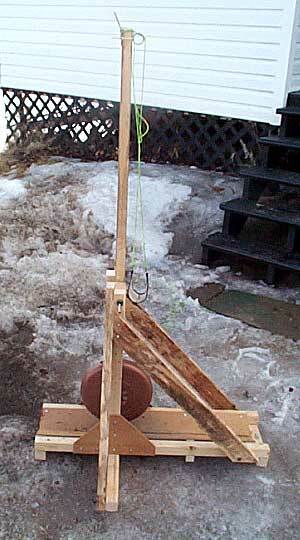 aka "Mangonel" - A torsion-powered siege engine, which uses a tightly twisted skein of rope as the power storage. 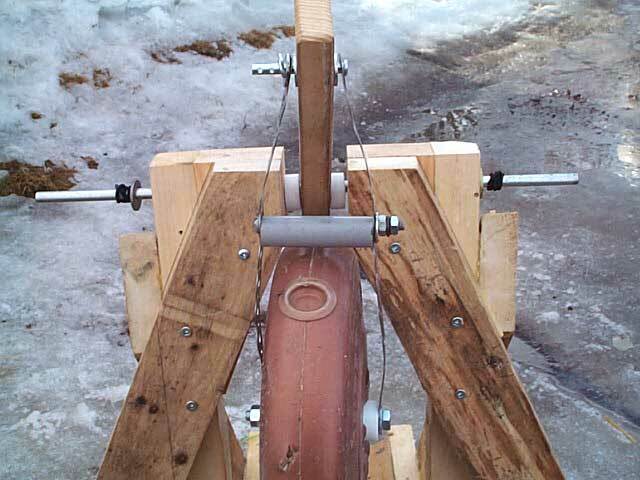 See Bob Carbo's Onager Online or Ron Tom's Mangonel.com.